Disclaimer: I was given products in this post for the purpose of review I WAS NOT paid to write this review. All opinions expressed in this post are my own. My kiddos go to bed at about 8:30, we have to get up at 5:30 and it takes them awhile to fall asleep. My hubby and I work 9+ hour days some times, so normally by 8:30 we are done!! Our thing is curling up on the couch together and watching tv. Over the years we found many shows together. It is kind of our thing :)! 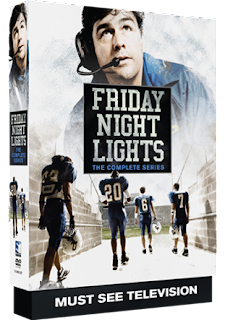 One of our favorites was Friday Night Lights! There was so much character depth in this show, and the relationships and story lines that were built were addicting! Sadly we never got to finish! Our son broke the shelf that our TV box was on and our dvr broke! Taking with it several hours worth of recorded shows. When they struggled, we held our breath. When they lost, we felt their pain. And when they won, we cheered them on again and again. Featuring: Kyle Chandler (Netflix’s Bloodline), Connie Britton (TV's Nashville), Aimee Teegarden (Rings, TV’s Notorious), Taylor Kitcsh (American Assassin, Lone Survivor), Minka Kelly (Hulu’s The Path), Adrianne Palicki (TV’s The Orville), Scott Porter (TV's Hart of Dixie), Jesse Plemons (TV’s Fargo), Michael B. Jordan (Creed) and many more!